Curry as NBA 2K19 MVP? Steph Curry is the only NBA ever to win the MVP in unanimous fashion and one of only 13 players to have earned the honor more than once – back-to-back at that. “There is no narrative,” the five-time All-Star told Marcus Thompson of The Athletic by way explaining the reason why. "Every year, there are a few players in the mix. This year, it's like five deep. If you're not in that conversation... I just know the narrative isn't there so I would have to go above and beyond. So, it's whatever. I'm blessed to have three rings. I'm good." The 30-year old is correct in that it helps to have momentum from the media which determines the MVP. Many people think LeBron James has probably the best chance to be named for the award for the first time since 2013 because of the Los Angeles spotlight and the narrative of leading the Lakers back to the promised land. Others believe Giannis Antetokounmpo can soar to the top now that Mike Budenholzer is his coach, while Anthony Davis remains a pick because of his other-worldly talent and his legitimate Defensive Player of the Year potential. Kyrie Irving has some buzz and people will be following Kawhi Leonard's comeback story closely. For Curry, meanwhile, it's assumed that he can't win it because Kevin Durant is on his team and the two will split any potential first-place votes. 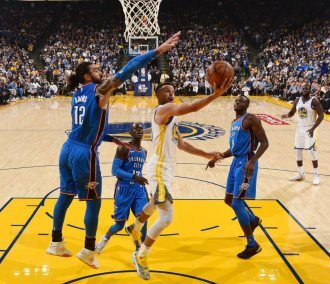 In NBA.com's annual GM survey, 27 percent picked Durant to capture the hardware, second to LeBron's 30 percent, while Curry appeared only in the "also receiving votes" category. Curry is as competitive as they come and absolutely wants a third MVP. But he also is comfortable in his own skin and understands the bigger picture. "We don't have three rings if I don't play the way I played," Curry told The Athletic. "So what else can I do? It sounds stupid and cliché and, whatever, passive. Like I'm deflecting or something. "But I know I've gotten better every year. I know that even if people don't. I'm better. That's all I need to know." In 2015-16, Steph Curry became the first unanimous MVP in NBA history. He averaged 30.1 points, 6.7 assists, 5.4 rebounds and 2.1 steals per game, while shooting 45.4 percent from deep, making 402 three-pointers in the process. He was fantastic again in 2016-17 – Second-Team All-NBA -- and he was even better in the 2017-18 season despite playing in just 51 games. So what does he have in store for this season? "I might be delusional, but I feel like I can get better at putting the ball in the basket," Curry said in a separate interview with Ben Cohen of The Wall Street Journal. "If I'm not at my peak, I'm right there in terms of how much better I can get, and I want to stay there." Curry's personal trainer, Brandon Payne, disagrees with the five-time All-Star. "He's not even close (to peaking)," Payne told the WSJ. "That talk for him is very, very premature. It's not even in our thought process." If Payne is correct, then the league's general managers are sleeping on Curry. Here are the results to the question: "Who will win the MVP in 2018-19?" in last week's NBA.com GM Survey:1) LeBron James, 30 percent; 2) Kevin Durant, 27 percent; 3) Anthony Davis, 17 percent; 4) James Harden, 10 percent. Curry appeared in the "also receiving votes" caetgeory, but it seems like he's flying under the radar right now. Curry missed the Warriors' preseason game in Seattle last Friday, but in the exhibition opener against the Minnesota Timberwolves, he made his first four 3-pointers and finished with 21 points in 20 minutes. That's not surprising when you consider what he told 95.7 The Game during Media Day: "It's been the best summer I've had in terms of my training (and) my preparation for a season." Photo: Stephen Curry drives to the basket during the Warriors vs Thunder NBA game opener in the 2018-2019 season.